John S. Blunt was a U.S. Navy Seabee during World War II. Serving in both the European and Pacific theaters, he acquired a number of trophies. 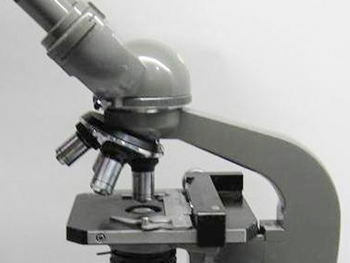 Among them was a high-quality Japanese microscope. He had saved a Japanese general’s life by providing him with antibiotics from the American base’s medical dispensary. The general was a high-ranking executive at Olympus, a company specializing in high quality optics gear. He offered Blunt the microscope as a gesture of gratitude. Several years later, Blunt, now the president of the Holmes-Blunt Group of Companies, struck up a conversation with a customs appraiser named Johnston. As it turned out, Mr. Johnston’s son David, a twelfth-grade student, had an interest in biology. Blunt offered him the loan of his Olympus and passed along the story of how he acquired it. David went on to become an influential biologist with Canada’s Department of Natural Resources. Retiring in 1994 as one of Ontario’s foremost authorities on rabies, he credits Blunt’s loan of the microscope with establishing the course of his life as a scientist. Apparently no one knows what happened to the microscope. We can’t always predict the good our gifts will accomplish. In today’s passage, Paul explains some of what he hoped would happen because of his collection. Namely, he hopes that this act of generosity will forge bonds between his Gentile congregations and the Jewish believers in Jerusalem. The New Testament is silent about what specific benefits (if any) Paul’s collection brought to the Jerusalem church or for the Gentile churches that raised it. We can have faith, however, that God blessed Paul’s good intentions and used the Gentiles’ gift for God’s glory. Phil Egan, “OPINION: Japanese Officer’s Gift Had a Big Impact on Young City Scientist,” The Sarnia Journal, 10 Sep 2017 . • What is at stake with Paul’s Jerusalem collection? • What difference does he hope this generous gift will make both for the believers in Jerusalem and for his Gentile converts? • What analogies might one draw to practices of Christian charity in our own world? Paul’s commitment was to carry the gospel to the gentiles. He had reached the point of proclaiming Jesus from Jerusalem to Illyricum (15:16-19). His new goal was to extend the mission to Spain and on his way to visit Rome, after he had carried the financial aid he had collected in Macedonia and Achaia to the needy believers in Jerusalem (15:22-29). But he was concerned about his reception and about his hope of reaching Rome and so he requested the prayer support of Roman Christians (15:30-33). Gerald L. Borchert, “Romans, Letter to the,” Mercer Dictionary of the Bible, ed. Watson E. Mills et al. (Macon GA: Mercer University Press, 1990), 774. Romans 15:25-29 focuses on Paul’s present preoccupation. “At present I am going to Jerusalem in a ministry to the saints” (v. 25). This is a reference to the collection for the poor in Jerusalem (Gal 2:10; 1 Cor 16:1-4; 2 Cor 8–9; cf. Acts 24:17). Churches in Macedonia and Achaia had shared their resources in an offering to assist “the poor among the saints in Jerusalem” (v. 26). There have been numerous attempts to explain what such a collection meant to Paul. Some have argued that the delivery of the collection fulfilled the prophecies that Gentiles would bring their wealth to Jerusalem in the last days (Isa 2:2-3; Mic 4:1-2; Isa 45:14; 60:5-17; 61:6; Mic 4:13; Tob 13:11; 1 QM 12.13-15). Others have con- tended that Paul hoped that the delivery of the collection would provoke the unbelieving Jews to jealousy (cf. Rom 10–11) and thereby speed the coming of the End. Both of these explanations are possible. Neither is mentioned explicitly in the text. All that Paul said here explicitly about the collection is in terms of reciprocity, a controlling principle in almost all Mediterranean relationships. “They were pleased to do this, and indeed they owe it to them; for if the Gentiles have come to share in their spiritual blessings, they ought also to be of service to them in material things” (v. 27; cf. 2 Cor 9:13-14). In terms of the assumptions of antiquity, such reciprocity proved a relationship among equals existed. This doubtless was Paul’s primary aim, whatever subsidiary goals he had as well. After completion of his delivery of the collection in Jerusalem, Paul aimed to “set out by way of you to Spain” (v. 28). The projected visit to Rome was subordinated to the apostle’s missionary plans just as his earlier absence had been. Romans 15:30-32 is an appeal for prayer. There are two specific requests. “Join me in earnest prayer to God that I may be rescued from the unbelievers in Judea” is the first (v. 31a). The second is that “my ministry to Jerusalem may be acceptable” (v. 31b). Acts 21:27-31 indicates that non-messianic Jews were catalysts in his arrest and imprisonment in Jerusalem. According to Acts, Paul’s fears were justified about the unbelievers. What about the Christian messianic Jews in Jerusalem? Acts 21:20-22 speaks about the thousands of believers among the Jews, zealous for the law, who have heard that Paul taught Jews living among the Gentiles to forsake Moses, not to circumcise their children, and not to observe the customs. If Paul’s opponents in Galatia and Philippi were Jewish Christians opposing a law-free gospel, then there must have been Jewish Christian opposition to Paul in Jerusalem. Furthermore, the nationalism that led to the Jewish Revolt of AD 66–70 may have been on the rise even in the late 50s. Acts 22:21-22 seems to indicate that this was so. The very mention of Gentiles starts a riot! Such nationalism led to the later decision that the temple should accept no further gift or sacrifice from a foreigner (Josephus, JW 2.409-10), a prelude to war. The possibility was very real, therefore, that the Jewish Christians in Jerusalem would not accept Paul’s collection from the Gentile churches in Macedonia and Achaia. Indeed, we do not know for a fact that it ever was accepted! Paul’s request for the Romans to be his prayer partners was fully justified by the unbelievers and believers who opposed him. If, in fact, all worked out in Jerusalem, however, this would allow Paul to visit the Roman Christians “with joy and be refreshed in your company” (v. 32). As it turned out, according to Acts, Paul did indeed visit the Roman Christians but not because his collection visit worked out. He came to Rome as a prisoner. Romans 15:33 is a peace wish such as can be found elsewhere in the Pauline letters (cf. 1 Thess 5:23-24; 2 Cor 13:11b; Gal 6:16; Phil 4:7-9; 2 Thess 3:16; Eph 6:23). With this the apostolic parousia segment of this letter is at an end. Charles H. Talbert, Romans, Smyth & Helwys Bible Commentary (Macon GA: Smyth & Helwys, 2002), 330–31.